Join USAG Bavaria Family and MWR as we celebrate the holiday season with the 12 Days of Christmas contest featuring a daily promotion on Facebook. 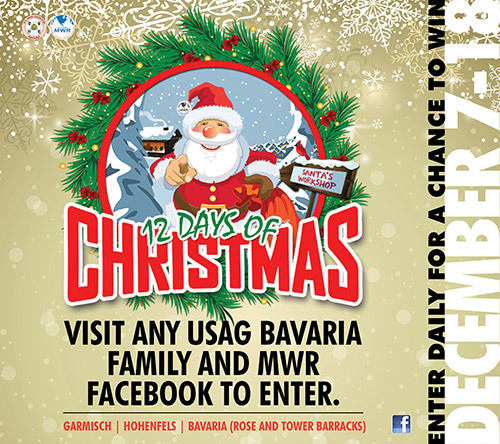 Visit the USAG Bavaria Family and MWR Facebook page to enter daily from December 7-18 for a chance to win. This contest is open to U.S. ID card holders 18 and older. Only one entry per person, per day. Only one prize per household for the contest. Must be 18 or older and a U.S. ID card holder to participate. Employees of Family and MWR and members of their immediate family are not eligible to participate/win. Submissions MUST be posted to facebook.com. Only one (1) entry per person per day. Only one (1) prize per household for the contest. By entering this contest, contestant verifies submissions are created solely by the entrant and do not infringe on copyrights, trademarks, moral rights, rights of privacy/publicity or intellectual property rights of any person or entity, and that no other party has any right, title, claim or interest. Winners chosen by random generator. Daily contests begin December 7 and are open 8 a.m. – 4 p.m. Final daily contest will be posted December 18. Entries for this are due by December 20 at 9 p.m. Winner will be notified on December 21. Winners will be announced on Facebook after notification. Weekend contest winners will be announced next business day. For this contest, Family and MWR disclaims all liability for any delays, misdelivery, loss, or failure in the delivery of any item sent by electronic transmission. By participating, all contestants and winner(s) grant Family and MWR exclusive permission to use their names, characters, photographs, voices, videotape, and likenesses in connection with promotion of this and other promotions and waive any claims to royalty, right, or remuneration for such use. Winner(s) will receive prize specified for the daily contest. Prizes are not redeemable for cash or exchangeable for any other prize. All prizes must be redeemed from Family and MWR within ninety (90) days of the contest end date (December 21). By participating in the contest, each participant and winner waives any and all claims of liability against Family and MWR for any personal injury or loss which may occur from the conduct of, or participation in, the contest, or from the use of any prize. Odds of winning depend upon the number of participants. Each winner must submit proof of eligibility and sign Family and MWR’s release form to claim the prize.